For a strategic border area in its third year of a brutal war between armed militants and security forces, North Sinai receives remarkably little coverage in mainstream media. As the area has become off-limits for outside journalists, and as most local journalists have little space to operate, the security apparatus has become the main channel of information about the conflict-torn area. It is now common to find the same news story identically reproduced in all media outlets, always crediting the official Facebook page of the Armed Forces spokesperson. Most of these articles either tout successful military operations on militant targets, or describe casualities from the ranks of the security forces incurred in attacks by militants. In response to this militarized narrative, some of Sinai’s residents have taken to Facebook to fill the information gap in different conflict-stricken cities, creating networks that have come to serve as news sources for the local population. “We are not journalists, but our reality has forced us to report the suffering of our people,” declares Sinai News 24, one of the locally run Facebook pages reporting from North Sinai. The page was created in September 2013 and now has almost 130,000 followers. Major international news outlets including Reuters and France 24 have used the page as a source, but local media outlets look upon these examples of citizen journalism with skepticism. 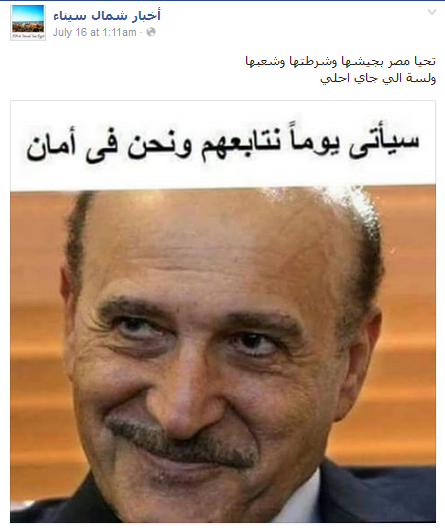 One of the page’s administrators, who spoke to Mada Masr anonymously, says Sinai News 24 launched shortly after the start of the military operation in Sinai in 2013, which followed the ouster of the Muslim Brotherhood government in Cairo and the subsequent surge of violence in the already turbulent peninsula. After they noticed local journalists fleeing, the administrators created the page to address what they felt was a falsification of facts about the conflict in the media. Sinai News 24 has developed over time, now publishing concise, informative posts that are easily picked up by news agencies. Other posts contain detailed descriptions of events, putting names and faces to the dry news that come up in the Armed Forces statements. The page often publishes pictures of victims of violence with stories about who they are, alleging that some of those killed in exchanges of fire with the military are sometimes randomly targeted. 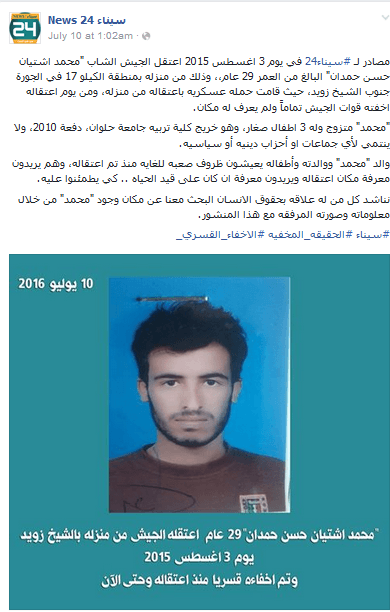 Sinai News 24 page posts the story of Mohamed Hemdan, who was forcibly disappeared after his arrest on August 3, 2015, including details of his background and family. The page’s first major hit was a video showing two young men being tortured to death by the military. The Armed Forces had reported that the men were killed in an armed confrontation. The graphic video was picked up by major news outlets, but the page administrator thinks the video accomplished something far more important. “We felt the importance of our role when we made people, young and old, speak up about what they face, and this first video that we published broke the fear barrier,” the admin says. He elaborates that people had been too scared to speak up, even when they found false reports about their loved ones being killed and labeled terrorists, which is often done by mainstream media, citing military sources. But after the growth of Sinai News 24 and similar outlets, people started to reach out to reveal the truth about the violations to which they are subjected. This work remains highly risky. The admin explains that security forces prohibit the use of cameras in all of Sinai, especially around military installations. He says being caught with footage on camera can lead to detention or worse. Members of Sinai News 24 have been arrested while reporting, and some have been in life-threatening situations, he says. The admins created a backup page with the same name that they resort to when their page gets shut down, which often happens when their posts get reported to the Facebook administration, incidents that they believe are orchestrated by security forces. Militants are another threat, he says, as they also retaliate against independent witnesses’ attempts to document the violence. The admin explains that Sinai News 24 depends on a network of volunteer reporters, each reporting from their own area so as not to attract attention as outsiders. The page has gradually gained the trust of people through a verification mechanism where they cross-check the facts with several reliable sources. “We believe that we have a patriotic role to raise awareness about what’s happening in Sinai, because we see what no one else sees,” he says. The locals’ participation in the comments section acts as another layer of verification. Most news published on the page, whether about electricity outages or explosions heard in a certain area, is followed in the comments by elaborations, confirmations, denials or corrections posted by people from the concerned areas. A 33-year-old resident of Arish, who talked to Mada Masr anonymously, says residents have come to consider local citizen journalism initiatives as their main source of information, while still taking their reporting with a pinch of salt and being aware of the pages’ respective political alignments in a highly polarized atmosphere. The resident says that through observation of their work, locals have tied each page to a certain camp. For example, due to its proximity to the events and ability to post videos of incidents of violence immediately after they happen, people suspect Sinai News 24 of being connected to militants, but trust their news nonetheless, the Arish resident says. 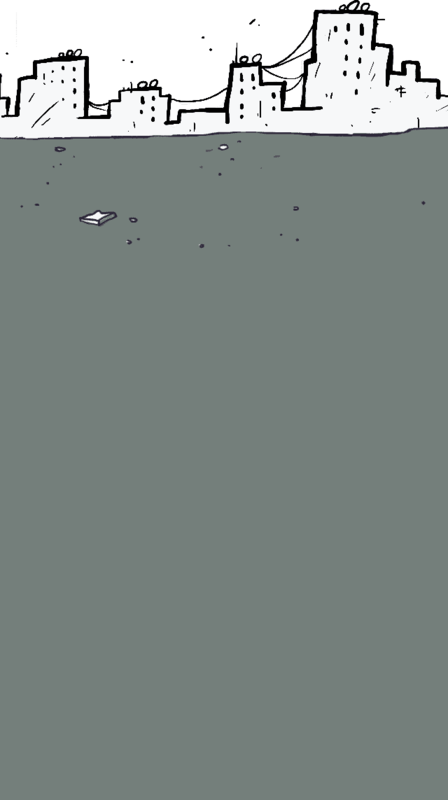 The North Sinai News page is known to be aligned with the military, and the interviewed resident believes they have a security source directly feeding them. While wary of their direction, he uses the page to get updates on attacks and other news where security is the main source, as the page gets that information first. 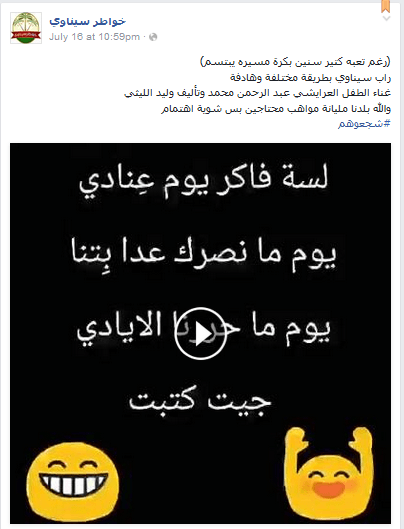 The resident also says that Khawater Sinawy (Thoughts of a Sinai Resident), another popular page, is known as an opposition page that is aligned with the people. He trusts this page in particular. Besides news reporting, Khawater Sinawy posts about charity cases in need of support, announces news of deaths and funeral dates, and even engages its audience with light-hearted community-building games. The page also depends on a network of volunteer reporters for its news gathering. Khawater Sinawy posts a rap song composed by a young boy from Arish. Singer says that these locally run Facebook pages have succeeded in relaying the news of areas in Sinai that are largely invisible to mainstream media, and have the support of a large number of locals who assist them in their reporting. However, he considers them too politicized to serve as dependable news outlets. “The pages are run on political inclinations and don’t provide complete and objective information,” he says, underscoring how these pages largely focus on violations by the security forces. In an attempt to fill the gap of professional journalism, Singer had launched the only licensed media website in Sinai, Sinai Now TV, which aimed to go beyond the news and produce weekly shows discussing Sinai affairs. However, due to difficulties in finding qualified staff and the deteriorating security state since 2013, the project was aborted, leaving behind only a Facebook page that has accumulated approximately 135,000 followers. But despite their shortfalls, these pages remain the only alternative to mainstream media, which Singer says is unable and unwilling to report Sinai’s events.